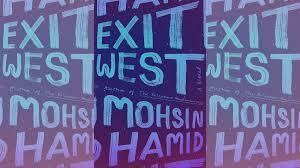 “Exit West,” by Mohsin Hamid is a creative, complex, deeply felt saga that reads almost fable-like. Set in an unnamed Middle Eastern City on the brink of civil war, readers are introduced to the main characters of Nadia and Saeed on the brink of falling in love. They are young gen x’ers who couldn’t be more different in personality – she is self-assured and independent and happily living alone, to his tender, quiet ways, dutiful to the parents he still lives with. They meet while taking evening classes, growing closer as they watch their country quickly fall apart. At first they can meet like normal new dating couples at cafes and coffee shop, but when soldiers with guns, curfews and checkpoints become their reality, their romance is interrupted and challenged until Saeed loses his mother to a bullet and he suggests Nadia would be safer with he and his dad.